After the relatively poor performance of U.S. in the 2018 Winter Olympics in PyeongChang, South Korea, we found it a unique opportunity to look at the placement of U.S. in the Olympics over the years to determine if the country’s success has really been changing. To explore this opportunity, we used an Olympic reference dataset (https://www.sports-reference.com/olympics/) that contained information on every athlete’s Olympic results including events participated in, medal placing, country represented, and place of birth. The data for the country’s athletes was collected from an Olympic reference dataset (https://www.sports-reference.com/olympics/). In addition to the athlete data, we also needed data about the countries themselves, specifically population data. After our data was collected we needed to define a way to measure the success of a country. As a group, we decided that we would measure a country’s success based on a medal per participant and a medal per capita basis. We felt as though this was the most impartial basis to determine success of a country because it minimized the skewness that would be caused by countries, such as the United States, who have much higher participants in each of the Olympic Games. Without the per participant or per capita number, success would be determined on a total medal count and countries, such as the United States, would have a higher chance of winning medals because they have more participants. After we collected our data and defined the measures of success, we then moved into our analysis stage. We explored the data to analyze the United States’ performance in the Olympic Games over time and determine whether the dominance of the United States has declined over time. In order to compare the United States’ performance over time we needed to come up with a measure that is capable of being applied to each of the past Olympics evenly. Due to the number of events constantly increasing, it is obvious that the number of medals the U.S. has won would also increase over time and is therefore not a fair comparison between past and current Olympics. To counter this change, we decided to measure the number of medals that the U.S. won and divide it by the number of U.S. athletes that qualified for the Olympics for each year. Because both qualifications and medals should increase evenly with the number of events, it allows us to compare how successful our athletes were at each Olympics across history. 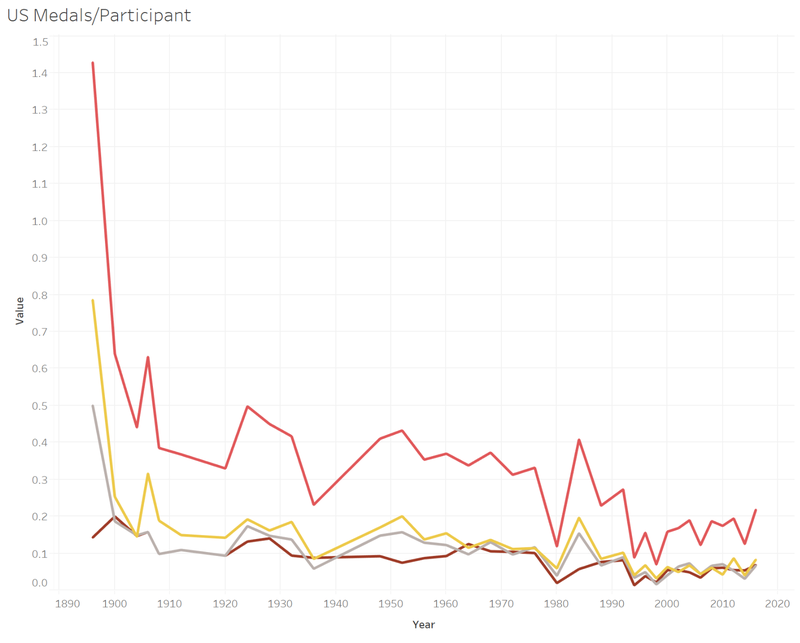 Figure 1: Graph of U.S. medals per participant over time. The red line observes the total medal count per participant while the gold, silver, and bronze lines each focus on the individual medal count respectively. The results of our analysis are shown above in Figure 1. Based on this measure, it is clear that the U.S. has become less successful in recent years. Since the 1992 Summer Olympics in Barcelona, Spain, it seems that the U.S. has taken a more drastic slide in medal placing, showing that participants are receiving medals at half of the rate that they were for most of the 1900’s (dropping from about 2 in 5 to 1 in 5). This is especially surprising given the dominance that Michael Phelps has had during the majority of that period, accounting for 28 U.S. medals on his own over a 16 year period. One other thing to note is that the first few Olympics seem to be outliers in the number of medals won. At the time, fewer countries participated in the Olympics so it makes sense that the U.S. was relatively more successful during the first few. When comparing countries over time, we wanted to first establish an overall total medal count for each country, so we choose to make a heat map of the summed medals won at each Olympic games for all the countries in the world. Figure 2: A heat map of the total number of medals won by country. Darker green means that the country has won a relatively larger number of medals while dark red means they have won relatively fewer. Any countries not colored in have never won a medal at the Olympics. It can be seen from Figure 2 that the United States has the highest total medal count. This shows that the United States has been the top historical performer on a pure volume basis. From Figure 2 we noticed that the size of the country seemed to help determine Olympic success, so wanted to see if there was a more accurate way to visualize a country’s performance at the Olympics. To this end, we created another world map visual. 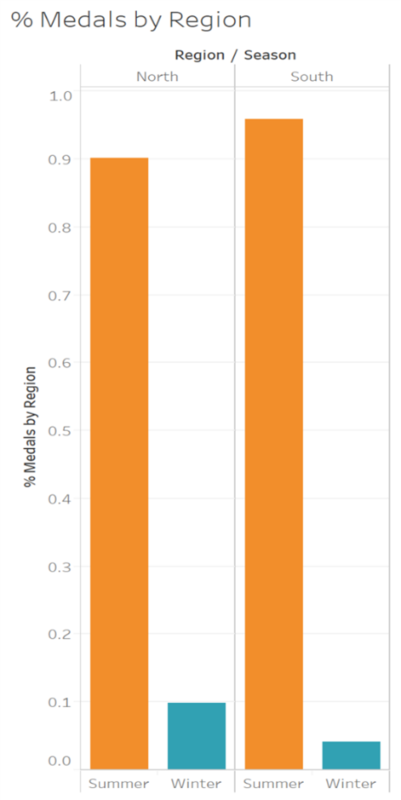 This time, we used total medal count in tandem with country population data from https://data.worldbank.org/indicator/SP.POP.TOTL. 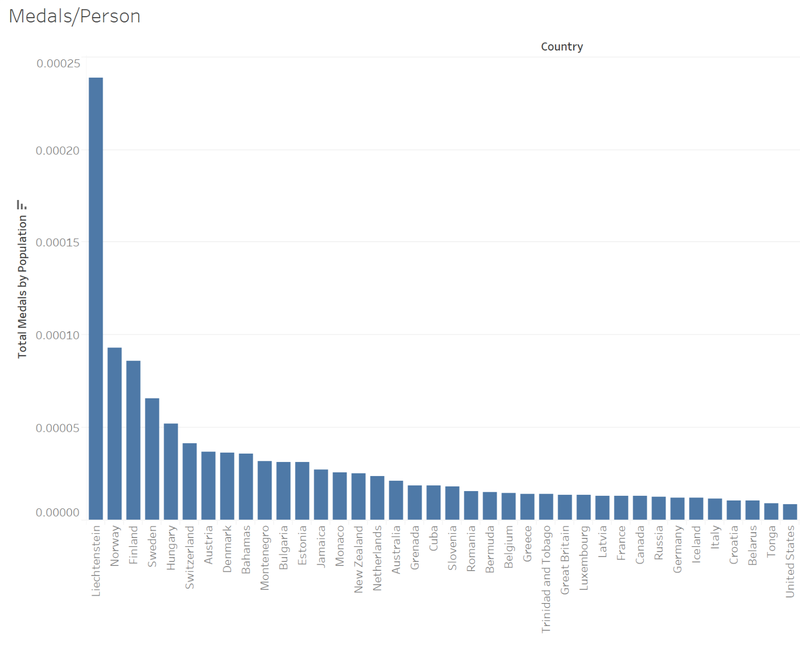 By dividing medal count by population, we were able to visualize and rank countries on a per capita basis. Figure 3: A heat map of the per capita number of medals won by each country. This result was derived by taking the total number of medals won by a country in its history and dividing it by the population of the country in 2016. Darker green means that the country has won a relatively larger number of medals per capita while dark red means they have won relatively fewer. Any countries not colored in have never won a medal at the Olympics. Figure 4: A bar graph showing the top 38 countries based on medals per capita results. This derivation was the same as in Figure 3, but shows the top countries listed in order of the best results. The per capita medal information from Figures 3 and Figure 4 provides another perspective of Olympic success. It is a better indicator of the average Olympic skill of a country because it accounts for the smaller athlete pool of less populous nations. One major takeaway is that the United States is far less dominant in this metric than in the total medals map. The U.S. flips from dark green to light red on the heat map in Figures 2 and Figure 3 respectively, and then falls from 1st to 38th in overall rankings for total medal count and per capita medal count, respectively (as seen in Figure 4). Another interesting result of the per capita analysis is the dominance of Liechtenstein. As can be seen in Figure 4, the tiny European country has more than double the medals per capita of any other nation. Liechtenstein is also the least populous country to ever medal at the Olympic games, with a population of just 37,666 in 2016. Liechtenstein has won ten medals in its history, and interestingly all ten have been in Alpine Skiing. Even more intriguing is that seven of those ten medals have been won by one family! The success of Liechtenstein in our per capita metric is indicative of a potential pitfall of using a per capita method. There is extremely high variability in countries with very small populations, as can be seen by the fact that ten medals is enough to make Liechtenstein more than double any other nation in this metric. Neither total medal count nor per capita medal count should be seen as an end-all-be-all metric of Olympic success. Another takeaway from the per capita data that we wanted to investigate further was the success of the Nordic countries such as Sweden, Finland, and Norway. They all rank very highly on a per capita medal basis, and we wanted to investigate why that might be. Our hypothesis was that their success was driven by dominance in the Winter Olympic Games, given the snowy climate of the region. To test this, we decided to make the same per capita map based only on the Summer Olympic Games, to see if the Nordic countries regressed in the rankings because of an overreliance on winter medals. Figure 5: A heat map of the per capita number of medals won by each country in the Summer Olympics. This result was derived by taking the total number of medals won by a country in the Summer Olympics and dividing it by the population of the country in 2016. Darker green means that the country has won a relatively larger number of Summer Olympic medals per capita while dark red means they have won relatively fewer. Any countries not colored in have never won a medal at the Summer Olympics. To our surprise, the countries we expected to regress looked even stronger in the Summer Olympics heat map from Figure 5. The Nordic countries turned an even darker shade of green compared to the rest of the world. This showed us that their success was not relying on the winter games, and those countries were in fact also very strong in the summer. This indicates that their success is due to other factors, perhaps such as superior training facilities and programs or an overall more athletic population. After looking at all the countries on a per capita basis, and noticing that northern countries looked to have the most success, we wanted to see if the northern part of the United States had significantly more success than the southern part of the United States. To do this we took the top 10 most populous cities in each part of the United States and collected data based on those cities and the Olympic athletes that were born in those cities. We then used that data to compare the success of each part of the United States. In the map from Figure 6 below, the United States is shown with dots in the location of each city used in our data collection. In the figure, the bigger the dot, the higher total medal count for that city. The orange part of the circle is the medals won in the Summer Olympics and the blue part of the circle is the medals won in the Winter Olympics. We also chose to analyze the percentage of medals won in the Summer Olympics vs. the Winter Olympics overall based on whether the athletes are born in the north or south part of the country. We predicted that athletes born in the north would be more successful in the Winter Olympics, while athletes born in the south would be more successful at the Summer Olympics. These percentages can be seen in Figure 7. Figure 6: A map showing the medals won by athletes from each of the 10 most populous cities in the north and south half of the United States. The size of the circle represents the total number of medals won by athletes from that city. The blue portion of the circle represents the percentage of those medals won in the Winter Olympics, while the orange part represents the percentage won in the Summer Olympics. Figure 7: A bar graph showing the percentages of medals won in the Summer Olympics vs. Winter Olympics. The results are based on whether the medal was won by an athlete from a city in the north half of the country or a city in the south half of the country. After looking at the figures above, we were able to determine that while the northern half of the United States is not drastically more successful overall, they have been noticeably better in the Winter Olympic Games as opposed to the Southern United States. Ten percent of the northern United States’ medals were won in the winter in comparison to the southern United States’ 4%. It should also be noted, that while it looks like the U.S. is far more successful in the Summer Olympic games, there are many more events that take place in the Summer Olympic games, making it more likely to win a medal in the Summer. Similarly, the inaugural Winter Olympic games took place in 1924, 28 years after the first Summer Olympic games, helping make the medal percentages more lopsided than they already were. After looking at the per capita medals of different countries and seeing how few so many countries had, as well as the surprisingly large portion of overall US medals Michael Phelps won while he competed, we wondered what the expected characteristics of Michael Phelps would be if he were a country. To do this we calculated both the average number of people per medal and the average amount of land area per medal. We did this by dividing the total number of people and land area by the total number of medals available in the 4 Olympics Phelps competed in. 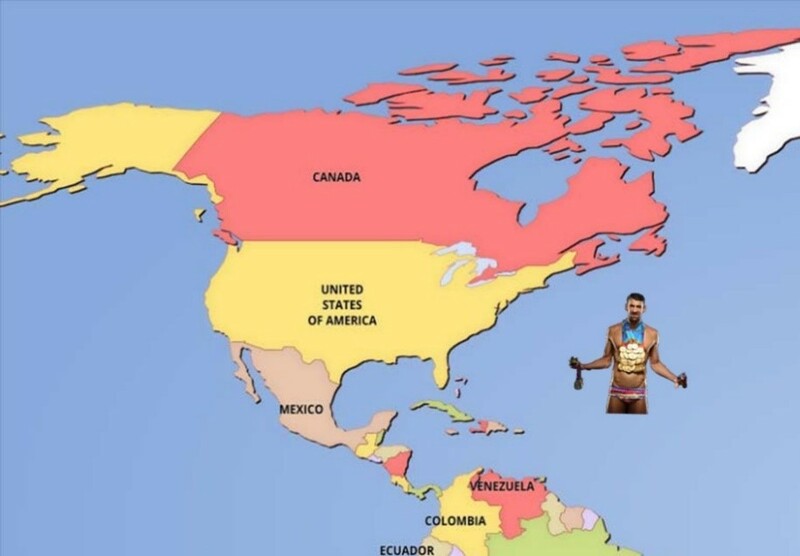 Based on this, we found that if Michael Phelps were a country he would be expected to have a population of 57,501,375 and a land area of 442,794 square miles. This would make him the 24th largest country in population and land area! A similar sized country is South Africa. Just for fun, we decided to make a to-scale visualization of what the country of Michael Phelps would look like on a map. Figure 9: A map showing a to-scale representation of how large a country represented just by the Olympic medal count of Michael Phelps would be expected to be. This analysis was done only considering his results compared to the rest of the world in the 4 Summer Olympics in which Phelps competed. Overall, the United States still performs well in the Olympic Games. However, per capita the US is not as dominate as they may sometime seem. There are countries, such as Lichtenstein, with much higher numbers of medals per capita. Many of these countries are concentrated in Northern Europe. These countries tend to perform well in both the Summer and Winter games. Part of the reason that the number of medals the United States wins is likely decreasing is because of the growing dominance of developing nations such as China. Competing at a high level in the Olympics is incredibly expensive for countries. When looking at a map of Olympic success per capita, success seems to track closely to global wealth and development. Many countries, such as China and South Korea have rapidly developed and increased in wealth. These countries have begun to perform well at the Olympics recently which increases the difficulty for US athletes to win medals and decreases the US medal count. The Olympics have also added many new events in recent years, many of them, such as rugby, the US is not particularly strong in. Just as there a high concentration of medals won by athletes born in Northern Europe compared to other regions, there are significant geographical differences in the number and type of medals won based on the birthplace of athletes within the United States as well. For example, athletes born in cities in the northern half of the United States tend to perform better in the Winter Olympics than those born in the southern half. However, there is not a lot of difference in overall medal totals between these two groups. 1. World Bank Group, “The World Bank: Population, Total,” 2018. [Online]. 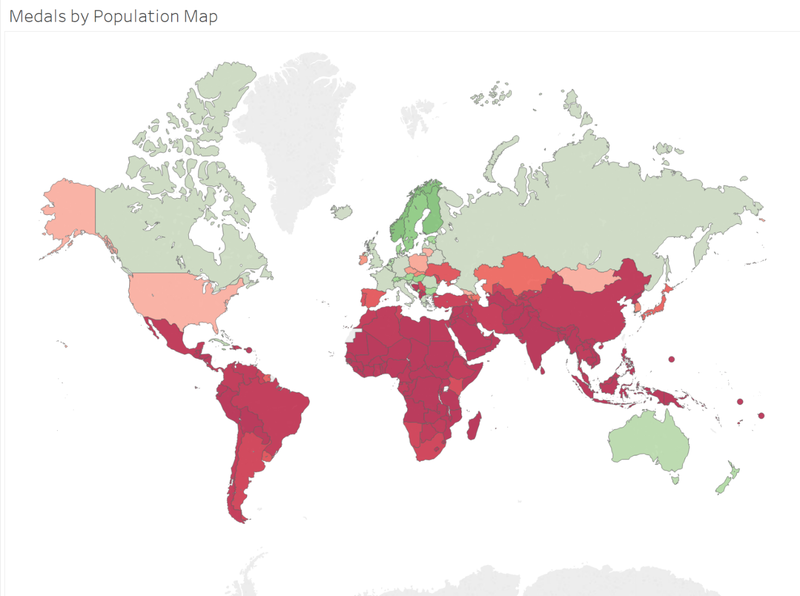 Available: https://data.worldbank.org/indicator/SP.POP.TOTL. [Accessed 1 April 2018]. 2. Wikipedia, “Liechtenstein at the Olympics,” 6 April 2016. [Online]. Available: https://simple.wikipedia.org/wiki/Liechtenstein_at_the_Olympics. [Accessed 18 April 2018]. 3. Sports Reference LLC., “SR/Olympic Sports,” 2016. [Online]. Available: https://www.sports-reference.com/olympics/. [Accessed 1 April 2018]. It was a really interesting analisis, it was also funny the final comparison with Michael Phelps as a country. However, I think it was a wrong assumption to relate the Scandinavian countries with winter sports since the most of winter sports are performed in the mountain and that countries are plains. It could be a better assumption for countries as Switzerland or france where are good facilities related to that sports. I would do an analisis about winter olympics instead of summer olympics which I think that could present better results. It would be also interesting to analize the gross interior product instead of population since countries as united states with a better economy are able to form better sportists than poor countries where people have worse facilities. Interesting analysis! I found it interesting how much the US medal count has declined over the years and how when looking at athletes per capita, we really are not as strong as I had always thought. I liked the use of splitting up the medals by summer and winter olympics which showed that the US preforms much better in summer olympics. Loved the comparison of Michael Phelps as his own country! I thought this was a very perceptive way of looking at Olympic data. This report had some intuitive calculations done in it to draw conclusions about Olympic performance in different countries (the relative success of Scandinavian countries in the Summer Olympics was interesting, and the split between the northern and southern US vis-a-vis Winter Olympic performance, while not surprising, was cool to see visualized). One thing I thought about while reading the report is that it is probably less about the US declining in performance and more about the rest of the world improving in performance. As countries develop, both economically and culturally, they are bound to start giving the US more competition, so it is only natural that we aren’t dominating across the board like we have in prior decades. Also, good for Michael Phelps! Some very interesting findings. I liked how you figured out a way to remove the bias that would have existed in the data. By creating a measure for number of medals per qualifying athlete, you were able to do so. Nice job! I really enjoyed reading the analysis of United States’ performance in the Olympics. I like your simple way of removing bias that countries like the United States that send a lot of athletes to the Olympic games. I think the geographical view comparing winter performance is interesting. I know some of the most successful winter sports athletes (i.e. Lindsey Vonn, Bode Miller, and Chloe Kim) are all from northern states, but I was surprised there wasn’t more of a distinct trend. One thing I think that could be added to the the report is a comparison of United States performance in individual vs team events. I think the heat map depicting the number of medals per capita is a very interesting representation. It would be interesting to break these medals down by certain events and try to get to the root cause of this success. Perhaps these countries have a certain area of expertise or value training for specifically the Olympics more? Thank you for sharing your analysis. I also find it quite interesting that the U.S. has decreased its medals overtime. I wonder if the addition of new events has an effect on this since the United States may not be as skilled in those events whereas they tend to continually dominate in the same events. I would have liked to see a figure comparing the top 5 events and see there change over time. It is pretty amazing though that Liechtenstein has had one family that has contributed to 7 of their 10 medals. I also expected to see a larger size circle of athletes from Denver that participated in the winter olympics. Chicago had a larger proportion of its pie chart which was not what I was expecting to see. Overall, I enjoyed learning more about the U.S.’s standings over the years in the olympics. Thank you for sharing your work. The visualization on where us medal winners are from reaffirmed some beliefs I had but also made we re-think some. Seeing that the north performs slightly better in the Winter olympics and the south slightly worse than the south in the summer olympics makes sense to me because of the temperature difference. The part that surprised me was that it appears chicago produces the most amount of medal winners. I would have expected a larger city like New York or Los Angeles to produce more medals. I completed a similar project to this in my ISYE 512 class this past semester. Rather than focusing on the United States dominance in Olympic history, we chose to investigate whether the hosting country had any sort of advantage compared to the away athletes’. 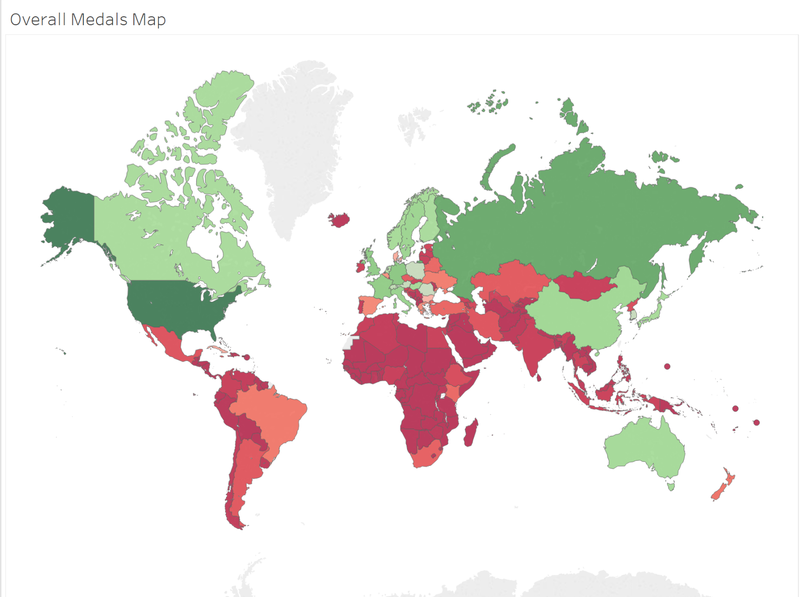 Your heat map (Figure 3) indicates countries with lower medal earnings to be in red. This makes a lot of sense when considering the analysis, I did. Countries in Africa, South America, and most of the Asia’s never seem to host the Olympics and be able to take the “home-field advantage” mainly due to their economic standing. Hosting the Olympics cost a great deal of money and often puts that country into some sort of debt from all the facilities they must construct and maintain. I thought it was very interesting that if Michael Phelps were a country he would be expected to have a population of 57,501,375 and a land area of 442,794 square miles making him the size of South Africa. I would be curious to know if there are more Olympic athletes that also have the equivalent or greater size. Overall this was a great report and analyzed very interesting metrics. 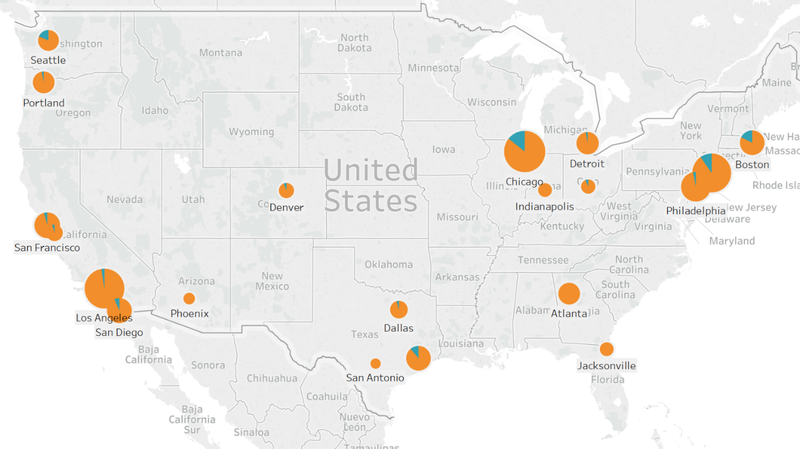 It is clear from your data that larger US cities lead to a greater medal rate. I wonder what this would look like in other countries. In Europe, I know that sometimes smaller cities foster greater athletes. I am surprised that the percentage of medals won in the north and south was so much higher during the summer than the winter. When looking at the heat map of the world that shows the number of medals won by each country, the United States is on the lower end of the spectrum appearing in light red. I am curious as to what is causing the discrepancy between the number of medals won in the winter/summer Olympics, versus the United States standing overall in the world for each Olympics. I think that the US is most likely not getting worse but that developing countries are getting better. Sport science has grown a lot in the US but other countries such as China and S. Korea and some other countries are being exposed to the benefits of the technology that has been developed around sport science and that is a possibility of the playing field evening out. This is a good read, as an avid sports (and Olympic Games) fan I really appreciate the different perspectives analyzed/summarized in this project. I never would have thought of analyzing the number of medals won per person. I feel as though this is the truest form of analyzing the medals count for every country, on an equal playing field. When you consider the technological gap the United States has over most other countries, their medal count isn’t all that impressive when observing the medals/person metric.